Allow me introduce you to the greatest thing ever. It's called PB2 a.k.a. powdered peanut butter. You may think... "What is that?" or "That sounds like the nastiest thing ever." But guess what? You'd be wrong. It's the GREATEST thing ever. They figured out a way to take the fat out of peanut butter!! 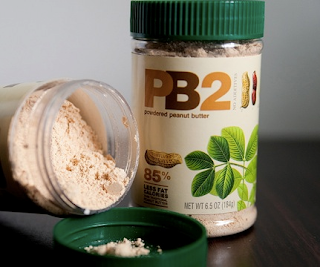 All you do is mix 2 Tbs of PB2 with 1 Tbs water and you've got peanut butter- minus most of the fat! Add it to your protein shake! Also, PB2 has only 3 ingredients- Peanuts, Sugar and Salt. 2 Tbs. of PB2 is only 35 calories and 13 grams of fat. And it also comes in chocolate flavor!